The music program is the first and largest program of The Bethany Group. At least 90% of the student volunteers participate in this program. 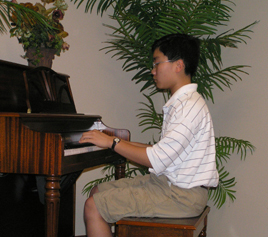 The program was established by Albert Trinh, and consists of music recitals that are performed at least once a month in rotation at eight different nursing and retirement homes. The most popular instrument is the piano, but there are also violin, cello, flute, clarinet, dance, vocal/chorale, poetry reading, and comedy routines. The musical skills vary widely, from students who have just begun music lessons to more experienced musicians. The residents just want to interact with the kids, and they do not mind the skill levels of the students—whether it is a second grader who just started taking music lessons, or a second-grade cellist who played the national anthem at a Cincinnati Reds game. The Group has a violinist member who plays with the Cincinnati Junior Strings Orchestra, and a pianist member who was featured on a National Public Radio “From the Top” program. The Group includes a whole chorale group from an elementary school—60 students strong—which performs at the homes as part of recitals. Some music teachers even send their students to perform, and sometimes they bring in all of their students to perform as a team. 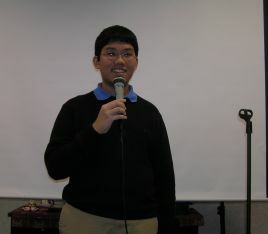 Dennis Trinh took over this program in 2006 when Albert graduated from high school and departed to go to college. To better present the program and to motivate the performers, Dennis posted some performances on YouTube. He also worked with Albert to open a Bethany Group Chapter in Dayton, Ohio, where Albert attends the University of Dayton. In 2015 Terry Tao took over and managed this program. 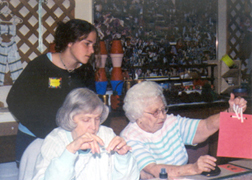 The Arts and Crafts program was conceived and initiated by a very resourceful member, Veronica Burkel. The projects are selected so that senior hands can still perform the tasks needed to make arts and crafts, and with enough student volunteers around to assist if needed. Examples of arts and crafts activities include the making of throw pillows, Christmas tree ornaments, bookmarks, window hangers, and prayer cards. After each session, residents can bring their prized art back to their rooms for display. Tajana Schneiderman succeeded Veronica Burkel in 2007 as the coordinator of this program when Veronica graduated from high school and went to college. With the support of her sister Katarina and many other friends, Tajana has made this program as fun and as well attended as ever. When Tajana Schneiderman went to college in 2012, Katarina Schneiderman took over and managed this program. Annette DiTommaso started a project to support the Bethany House shelter, which consists of three houses and some apartment buildings. Bethany House Services provide a full range of shelter and assistance programs to the homeless and low-income women and children. The Bethany Group’s support mainly involves doing yard work and housework, supporting the summer carnival, as well as entertaining the children housed at the shelter. Adrienne DiTommaso initiated this project to adopt a section of highway in the name of The Bethany Group. The application to the Ohio Department of Transportation was filed October 13th, 2003 and was approved on March 31, 2004. The section of the highway assigned to The Bethany Group is two miles of Interstate 71, from mile marker 28 to mile marker 30. Members need to be trained at the Lebanon ODOT office before they can participate in the cleanup sessions, and members have to review safety rules at the beginning of each cleanup session. When Adrienne graduated from high school and went to college, her sister Annette became the coordinator for one year until she herself went to college. 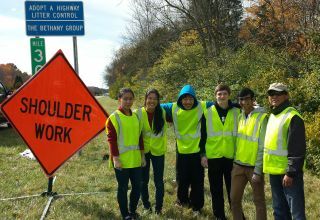 Kevin Li volunteered and was trained at ODOT to take over the program and his team has been very active since. When Kevin Li attended college in 2010, Sophia Li took over and managed this program. 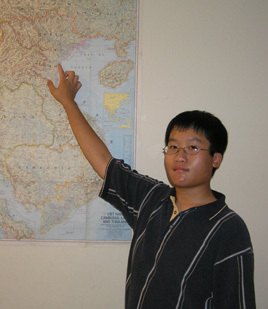 When Sofia Li went to college in 2014, Terry Tao took over and managed this program. In 2016 Kunal Patel assumed leadership for this program. Dennis Trinh initiated a slide shows program to allow Bethany Group members to present their different experiences to residents of the nursing and retirement homes. Current topics include Yosemite National Park and Wisconsin Dells. The digital projector used in this program was purchased with a generous Volunteer Support Grant from the Procter & Gamble Company. Dennis also invites the Cincinnati Art Museum to give slide shows at the homes. Since it is difficult for some residents to visit the museums, his idea is to bring the Museum to the homes. So far, there are two topics that have been presented by the Museum docents: the "Petra-Lost City of the Stone" show is based on the Museum's very popular exhibition of the same name and the "Christianity in Art" show that features the Christian arts from the 13th to the 20th Century that are exhibited at the Museum. When Dennis Trinh went to college in 2010, Erin Donnelly took over and managed this program. Ericka Haverkos and Emily Jump started an origami program. They not only select the origami foldings that senior hands can still manipulate (at times using soft materials such as napkins instead of paper), but also prepare PowerPoint presentations to illustrate more intricate foldings or colorful end products. The residents always have a great time with these hands-on origami sessions, which are often combined with a tea-drinking ceremony. The digital projector used in this program was purchased with a generous grant from the Procter & Gamble Company; some tea and cookies consumed in these sessions were donated by a Kroger supermarket. In 2007, Tajana Schneiderman took over this program. Recent research has validated what every pet owner already knows: interactions with animals can reduce our stress levels and increase our sense of well-being. Therapy animals are widely employed in elder care to improve the quality of life. Kevin and Ryan Donnelly and their pet dog Allie are certified in a therapy dog program called Pet Partners through the Delta Society. Allie passed the necessary test as a therapy dog and Kevin and Ryan passed their tests as certified handlers on March 21, 2004. They are now registered and certified through the Delta Society as a certified Pet Partners team. Kevin, Ryan and Allie have visited the Ronald McDonald House (affiliated with Children's Hospital Medical Center), Clermont Nursing Center, and Mason Christian Village. Kevin and Ryan plan to attend future Delta Society events and to make regular visits to the Clermont Nursing Center and other nursing homes over the summer. In 2007 Ryan and Erin initiated a reading program at Montessori Academy of Cincinnati where they attended many years ago as preschool students. In this reading program elementary students select books that they think Allie will enjoy, then read them aloud to Allie. Allie brings motivation to reading by providing a nonjudgmental environment that promotes confidence in a child's reading skills. When Ryan Donnelly went to college in 2010, Erin Donnelly managed these programs all by herself. Healing touch is an energy-based approach to health. It uses light, gentle touch to influence the human energy system. The energy system is the flow of energy through and around the body. The healing touch practitioner uses his or her hands to detect imbalances in the energy system and then uses light hand placements over the body or on the body to restore balance in the energy system and promote healing. The goal is to restore harmony and balance in the energy system to place the client in a position to self heal. 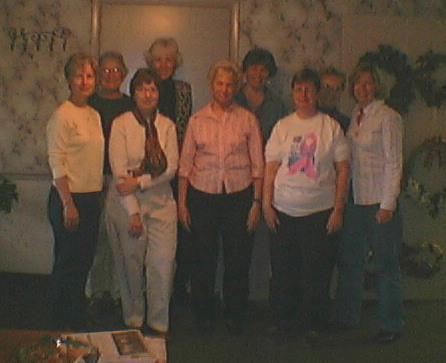 On 2004 National Make A Different Day, Veronica Burkel hosted a spiritual healing touch session for the residents of the Meadowbrook Care Center, where she is The Bethany Group coordinator, by inviting members of the Good Shepherd Spiritual Healing Touch Ministry. Their healing touch and prayer were a soothing remedy to the participating residents. The Good Shepherd church is now doing Spiritual Healing Touch at Meadowbrook Care Center four times a year. 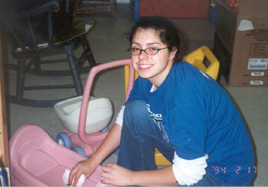 Although the program is still on going, the association of The Bethany Group with this program ended in 2007 when Veronica went to college. 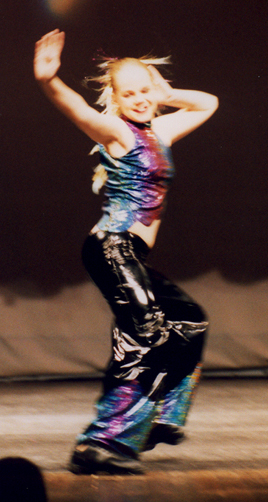 The Bethany Group Dance program was started by Chelsea Kessler in 2003 when she was a seventh grade student at Bethany School. Chelsea has been dancing since the age of six at Patty Pille’s School of Dance at Kid’s First and has been a member of the dance team since its inception in 2002. Chelsea and more than a dozen of her dance team friends have performed with The Bethany Group. The dancers, who train with Patty Pille and Alicia Dashley, have performed ballet, jazz, and modern ballet pieces. 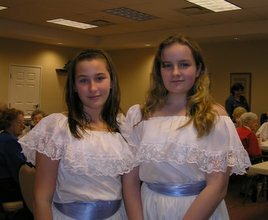 They have performed at two homes, the Waterford at Fairfield and the Lodge of Montgomery which have an area large enough for the dancers to perform their routines. The group will work to identify other homes which have enough space to allow the dancers to share their love of dance with others. This program ended in 2008 when Chelsea went to college. David Trinh initiated and oversees The Bethany Group's effort to help underprivileged women overseas via the Economic Opportunities Program (or the Group Guaranteed Lending and Savings Program). This program is operated by the Save the Children Federation and is designed to economically empower poor women by dramatically improving nutrition, health care and education outcomes for them and their children. The way it works is the following: Save the Children first makes a small, low-interest loan (about $30-$60) to a woman to help her start a small business. After about six months, if she makes progress, she then qualifies to ask for more loans to expand her business. The maximum duration for a loan is about three years and the total loan for each woman is about $300. The woman then repays the loan principal, and Save the Children uses the money to help another woman. Save the Children implements Group Guaranteed Lending and Savings and other microfinance programs in 18 countries and territories—Afghanistan, Armenia, Azerbaijan, Cambodia, Egypt, Ethiopia, Georgia, Guatemala, Jordan, Lebanon, Mali, Morocco, Mozambique, Myanmar, Nepal, Vietnam and West Bank/Gaza. In some countries, the United Nations actually asks Save the Children to manage UN loan money. David has focused first on one country in Latin America (Guatemala) and one country in Asia (Vietnam). The Save the Children Federation is very active in these countries: in Guatemala they have worked with 1,661 women and in Vietnam with 7,641 women. David led a successful fundraising drive for the programs. He has raised about US$2,000 and sent US$500 each to Guatemala and Vietnam in 2004, and $500 to Vietnam in 2005. The Bethany Group Clown Troupe was conceived and organized by Emily Jump and Ericka Haverkos. 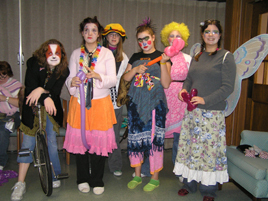 Over the summer of 2005, several Bethany Group members, including Emily Jump, Ericka Haverkos, and Dennis Trinh, attended a clown camp to acquire the skills to be able to entertain nursing home residents. They also invite other participants of the clown camp to join them to perform for the residents. Their clown acts include skits, juggling, unicycling, magic, and balloon sculptures. Each show is usually ended with a party with circus animal crackers and punch. Most canned food drives are organized around the big holidays of Thanksgiving and Christmas. On the other hand, The Bethany Group’s food drives are planned for the rest of the year to respond to the needs of the underprivileged families that remain the same year round. This need was identified by Erin Leventry who carried out Food Pantries Canned Food drives at local supermarkets. Erin and her friends collect cash, checks and non-perishable donations, and distribute the items to local food pantries. 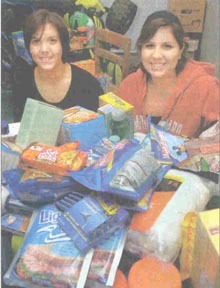 Erin also organized a special drive for the Katrina hurricane victim relief. 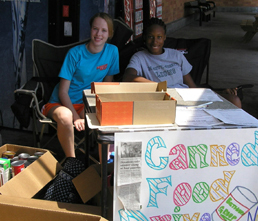 In 2007, Candace and Patrice Kirksey took over the program, and with the support of their friends, they have been very busy collecting foods and other items for the needy year round. When Patrice Kirksey went to college in 2010, Diana He took over and managed this program. To commemorate their cousin Taylor's death in Iraq, Dana and Danielle Prazynski initiated this program to support U.S. troops overseas. They collect toiletries, packaged snacks and other items from local businesses to make care packages to send to the troops. They also work at the Fairfield YMCA to encourage community members to write letters and notes to thank the troops. Their position is that, "It doesn't matter what political views people have, those are still our men and women over there." Dana and Danielle have the support of Emily Jump and their other friends in this effort. In 2006 Dennis Trinh established a program to support the Jarai, an aboriginal minority group in Vietnam. There are about 300,000 Jarai in Vietnam. They live in villages or hamlets in the woods or in the mountains in the highlands of Central Vietnam, separated from the Vietnamese. They have their own language and many do not speak Vietnamese. In an impoverished country like Vietnam, minority groups such as the Jarai are even poorer. Among them, the most unfortunate are people who have recovered from leprosy. They have been cured, but are still outcasts even in their own society. 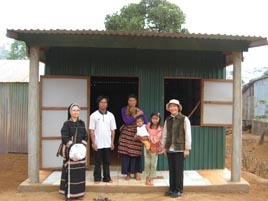 Dennis has been raising funds to build houses for these recovered lepers and their families. The Bethany Group supports some Vietnamese Dominican nuns whose ministry include this area. To date, Dennis has been able to send enough funds to build four houses and two tube-well systems. He has also been able to secure long-term sponsorships for two young Jarai girls with special needs. 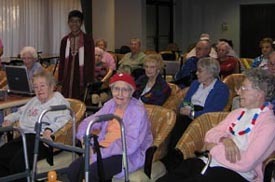 Suprasanna Mishra hosted a program to introduce India's culture to residents of nursing and retirement homes. The program include presentations on the festivities, mythology, and scenery of India. Of particular interest are traditional Indian dance sessions that Suprasanna organizes. These intricate and colorful dances always keep the full attention of the residents. When Suprasanna Mishra went to college in 2010, this program was on hold. The Bethany Group has participated in the National Make A Difference Day since 2004 at the urging of Mrs. Hope Taft, the First Lady of Ohio. Each year, the fourth Saturday of October is designated as the National Make A Difference Day, the day when about three million people in the U.S. volunteer for all kinds of community causes. Each year The Bethany Group has organized from ten to twelve different events on the Make A Difference Day. Please press the following link to view the details of our activities.